Please refrain from answering or commenting about your first computer/love/both. This is not the place for that. Please keep the discussion on topic. What was your first love personal computer? It should get deployed at some point today. I don't like the placeholder wording either. From a grammatical standpoint it irks me, and also from the standpoint of reading it as if English were not my first language it has a strong chance at being misunderstood. Which personal computer was your "first love"? First love is being used here as an adjective phrase. It's perfectly grammatical, but it's easy to misinterpret as personal is also an adjective, so the boundary between the two isn't immediately obvious. What was your first-love personal computer? would be clearer, but unless there's some reason the sentence can only have seven words then rewriting it would be better. 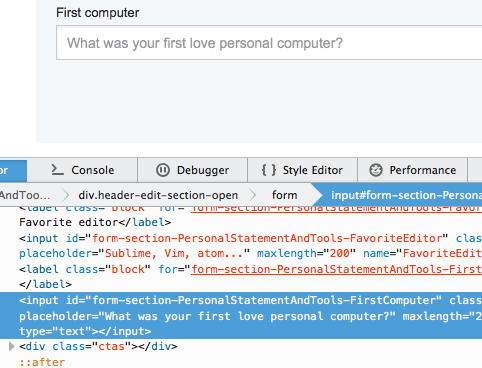 The field is simply called "First computer" so then mentioning love (or any other emotion) in the placeholder answer text seems odd. The first computer you owned - or at least used - is what I'd consider the starting point for your developer story (even if you didn't do any developing with it), but you may not have loved it. 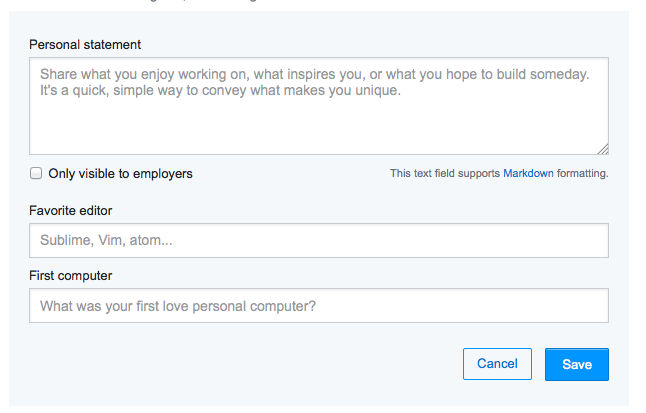 I vote for auto-complete adding the word love, without anyone to proofread the output. I may be completely mistaken, but that's how it looks like to me. Because otherwise the sentence makes no sense. first love is a kind of phrase here. This question means which is your first personal computer, as u always remember your first love likewise you remember your first computer. What was your first love / personal computer? Maybe there is a filter for non alphanumeric characters? If we were to take away reputation, does this community become what it once was?